I was a big surprise for my parents. My mother always wanted a big family, but after 3 children and a few miscarriages they thought they were 'done'. In the south we true southerners name our littles after a family member or a biblical name. We don't choose a name by the place we 'fell in love' or our favorite actress or the month we conceived. This month Sozo is introducing Wan Marsh at Sozo and she is fab. Before I met Wan I envisioned a tee-tiny petite hispanic or oriental gal with beautiful long black hair, quiet in nature. Right? Wan is a primo talented abstract artist. Her background is in interior design and she is a gardener and giver to nature and birds. She is a HOOT. Wide open, full of life, bubbly, in LOVE with what she does (people like that give me the biggest high), over 50 something years old, confident and curvy. She's the type that likes an ice cube in her chardonnay. Sassy and owning it. After being rejected from show after show she decides to change her name. And then the magic began. Wanda became WAN overnight. Wan was accepted into the next highly acclaimed art show and won 1st place. She's been on fire and selling to collectors all over. You must stop by Sozo and check out Wan's layers and layers of mixed media and collage fabulousness this month at Sozo. And please don't forget about inviting your friends named Linda, Sandra, Brenda, and Wanda. My nieces (and sisters/one of them named Hannah Brown/refer to paragraph three and Ruthie) are due with their 4th and 2nd babies just a few weeks a part. Not too many good names left on the ole' family tree. We're down to Killough (pronounced KILLA) Ivor, Gladys, and Narcissus. I'm voting for Killough. Killough Henry to be precise. Nobody's gonna push that boy down on the playground. No, I'm not referring to missing your yoga for 3 days in a row, or your daily Starbucks, or even losing out on a huge business deal. I don't want to bring us all 'down' with this post...but sufferings exist amongst all of us and they don't come easy. They sting and force you to have that 'I'm so tired of sobbing and dizzy feeling that I may throw up at any moment' feeling. One of my favorite scriptures from Corinthians, reminds us that when we suffer and endure hardships, we are better equipped to encourage and support others through their hardships. So if we don't let that grief and those hurtful times swallow us up or push us into a dark corner...then we march on. And we slap on a bandaid (with hot meals delivered by good friends for weeks), and cry big tears and wipe off snot (into the armpits of tremendous friends and neighbors), we learn who our real supporters are, we deepen our hope, and we heal. We heal. And we support. And the cycle continues. Meet Madison Licare. Madison is one of Myers Park High School's best and brightest artist they've seen in a very long time. Madison is inspired by the Renaissance and Dada periods and aspires to be one of best selling artist in our country. Take my word for it. She is beyond bravo, and yes sweet Madison has suffered. Her mother became pregnant with Madison when she was a high school student, and unfortunately abandoned Madison. Her mother suffers from schizophrenia. Her father abandoned Madison as well. Madison's grandmother has raised her, but not without difficulty. Guidance counselors have had to enter the home and plead to city officials in order to have water/heat turned back on. She's petite, soft spoken, and timid in nature.. .but once you discuss art... her dark brown eyes beam fire and she quickly chimes in on the imagination and force that nature and art has brought to her life. This child has suffered beyond what most of us could comprehend, and she has magnificent artistic talent and true composition. She lacks a small amount of money and has been accepted into one of our countries most prestigious art schools, Pratt Institute in New York City. Please join us on Thursday, June 4th from 530-830pm. Meet Madison, see her work and be a bigger part of her dream. See her passion and her hope in those big beautiful brown eyes. 100% of Madison's sales will go directly to her college fund. A percentage of Sozo's sales will support Madison's college fund as well. Let's surround this incredibly talented young artist with our support and help her fund her dreams. Come spread your mercy, your love and your kindness. If you are unable to attend but would like to donate toward Madison’s education, you may do so at this link to the MPHS Foundation - Please earmark your donation for Madison Licare. Donate via PayPal or google “MPHS Foundation" and click on "CONTRIBUTE"
Inslee Fariss, Sozo's figurative featured artist, who has illustrated for the likes of Kate Spade, Neiman Marcus, and Stuart Weitzman, spills on some of her favorite things. Join us Friday, March 27th from 5:30 - 8:30pm to meet Inslee and view her art at Sozo. Sozo: Go to wine or beer? Inslee: Wine - whatever my husband brings home from work! He’s director of retail for Manhattan Wine Company and is an expert in “mineraly french whites” in particular. My favorite beer is Colomba from Corsica. I discovered it on our honeymoon last May. Several of the paintings in the show were inspired by and named after various beaches we visited on our trip where we’d lounge around with our new favorite beer and I’d sketch sunbathers as figure studies. S: Tips for traveling? What one thing do you always make sure you have for the flight? I: I am a nervous flier because my greatest fear is being trapped in the sky in a tin can without an activity! So I always travel with a sketchbook and a laptop for writing and drawing. Best tip for traveling is pack lightly so you look really relaxed and easy going, and then figure out a sneaky way to slip more and more extra outfits into your husband/friend/travel companion’s luggage so you’re never caught in a new exciting place without the perfect outfit. I: I just received a Sailor Chalana fountain pen as a Christmas gift and it is so beautiful and delicate and creates the thinnest, most graceful lines. S: Workout? What gear must you always have/or be wearing? I: Yoga! I love Y2 Yoga when I’m in Charlotte and am a regular at a hot flow studio here in NYC. I’m becoming addicted to collecting crazy patterned leggings. Go to brands are Prism Sport and Jala Clothing right now. I: The Goldfinch. It made me feel melancholy but made me fall more in love with New York. I: Yes please. And big floppy wide brimmed hats. and long flowy caftans and coverups. And big cheery striped sun-umbrellas. Basically stay inside. Sun is not your friend. I: I believe that lips should just be an extension of a perfectly kept complexion, there’s no need to accentuate with complicated colors. I only use Aquaphor on my lips to stay hydrated. S: Clothing or shoe line? I: How much time do you have…? I’m a bit of a clothes horse. Just rediscovered how much I love a classic Jack Rogers sandal after partnering with them on a new illustration project to unveil this summer - stay tuned! And on the opposite end of the spectrum, I took the plunge on a pair of enormous platforms from Sigerson Morrison - all their new spring/summer pieces are must owns. I: Three solid brass bangles from a boutique in the West Village. I received one as a gift from my husband on three special occasions, our engagement date, the date of my confirmation in the church and the date of our wedding. The clang together musically while I work and remind me how lucky I am in love. S: What music do you listen to? Any certain genre while creating your art? I: I love some good juicy old soul music or contemplative jazz while painting, or on a particularly perky Saturday am painting session, some throw back 90’s hiphop. Biggie’s top hits and painting nudes really goes hand in hand. I: All of it. I love coffee. Just discovered the cortado - the smaller, lighter little sister of a cappuccino. I: Yes, but I’m too superstitious to tell you what they are. 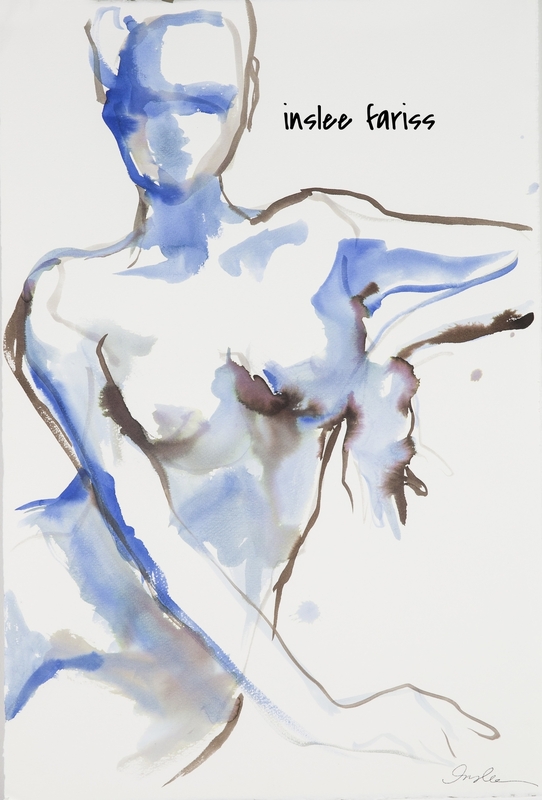 We can't wait to have Inslee at Sozo along with her beautiful nudes! What's that perfect gift that keeps giving? You know it. We've got works starting at $70! Local glass art, contemporary oils, works on paper, abstract oil hearts on glass, necklaces and more. Flowers wilt (even though we love our neighbors at The Blossom Shop). And chocolate goes straight to your booty! So make a small investment and give something that promotes conversation and curiosity and lasts a lifetime. Speaking of conversation and hearts... our hearts here at Sozo have been broken with the arrest and incarceration of one of our most favorite and loved homeless artist friends. She should have been taken to mental assistance, but instead, because of a misinformed and broken system, she sits and waits in jail - without receiving ANY treatment. "If you don't like something, change it." Right? So here we go. I love it when my husband 'comforts' me and says 'Honey this is WAY out of your ball park!' Dude...that is FIRE to my soul when you say that! Sozo loves nothing better than some uptown collaborating and creating. Minus the paint and canvas, we're about to help create some freaking amazing bridges. We've got former judges, public defenders, attorneys, doctors, jail liaisons, investors, psychologist and one spunky art gallery owner all coming together this week to create some magic. These folks have big hearts and are offering their time and wisdom and love to start the conversation. Conversations to connect, bridge the gaps, and identify resources. Besides selling some unbelievable art at Sozo and representing our 'family' of overly talented artist....we have a big heart. Of course we like connecting and selling you that perfecto piece that sings to your soul and says "TADA" when you enter that room. But we also want you to feel, hear and see our results in uptown. White collar plus conversation hearts. Dare me to start off our meeting tomorrow at the courthouse with a game? Nothing better than 'breaking down' some new friends, eh? Have a heart this Valentine's Day, and try stirring up some conversations of your own. Or better yet, come check out our art at Sozo and tell us what's on your heart. Yep, Conversation Hearts by the handfuls. On us! It started when my friend Jenny saw me walk in and asked, "are you okay?" That’s all it took. You know that feeling - your throat gets all tight and eyes swell with tears. I’m so thankful to have friends that know me so well … and just by peering into my eyes. I know I’m not alone. This seems to happen about every mid-August to many mamas I know. Or who knows maybe we can blame it on the Supermoon or menopause? Regardless, most of us are overloaded and overcommitted with back to classroom shopping, sending kids off to college for the first time, forms, physicals, school sign ups, football games, soccer games, carpool arrangements, committee commitments, "will you be a sunday school teacher?" And the list goes on. On top of which, I'm watching my Daddy die a slow death thanks to alzheimers, a Mother in pain who’s ‘lost’ her husband of 61 years, a sister who has drifted away from me, a daughter learning to drive, boys that freely ‘fight’ and wrestle on the floor fighting over the remote and an art gallery that is taking off bigger than I ever dreamed. I encourage all of you to surround yourself with those who lift you up - your yoga community, Red Hots Tennis team, bible study, prayer group, book club. Make a point to connect with those who will comfort you or call you out when needed. When life is messy I remind myself to keep my eyes on the one who created me and my heart open to His plans for me. It’s the only place I’ve found that offers refueling when I’ve got nothing left in my tank. Oh, and of course … my realist rockstar husband who knows how to listen with his heart - and embrace me with his ‘I’ll protect you forever hug,' or even wipe the snot from my face. Controlled Chaos. That’s my target. So with the chaotic end of the summer schedule, I’d like you to highlight stopping by for Claire Desjardins’ reception on Saturday, September 20th. Come meet her! Her bright, soothing colors will engage you and unfold an effervescent energy. And yes, she is ‘THE’ Anthropologie designer you’ve been hearing all about. If you don’t see any art finds that soothe your soul, I'll meet you at Flywheel. Back right row. Bike #43 and #44. I'll bring the hugs and tissues. Wine Club? Don’t even think about asking me to join. For the last two weeks I served as one of the Camp Seafarer nurses and it was a beautiful escape. While boating on the Neuse River (on our time off) with friends we were discussing all the 'dirt on life'-one being how important it is at a summer camp (or anywhere in life honestly) to show up BIG. Whether it's screaming/singing 'Let It Go' at the top of your lungs, assisting in an emergency call to the lake, consoling a homesick child or evacuating 600 plus children for Hurricane Arthur (that's another blog) then for crying out loud- SHOW UP BIG! Show up smiling. Put your best foot forward. Stop complaining. Bring it. It's contagious. All duds need not apply. Sozo's next brightest star is the incredibly talented Taylor Thomas. Taylor is our featured local artist until the end of August. This chick is no dud. She is showing up with abstracts created with big brushstrokes, big color and an unveiling story behind each amazing work. When Taylor describes her creative process you will capture a glimpse of her grace, humility and her devotion of showing up 100% while still humbly crediting others for her talented gifts. This gal has passion, purpose and is stepping out with some bold courage. Taylor's not settling. A sercy. Love them! Who doesn't? I like saying the word--try it. SERCY. I love surprising a friend with flowers from the Farmer's Market or gardenias from our yard to those crazy old fashioned photograph cocktail napkins that provide a good 'out loud' laugh. It's the little things in life…I'll credit my Mama for that lesson. However, when you are riding in the car transporting your 15 year old daughter from one destination to the next and she springs on ya, 'Hey Mom, SURPRISE! I'm getting a second earring piercing!' BAHAAAHA…I half snorted, and discovered nonstop belly laughter while wanting to cry. What happened to my smocked dress baby girl with a big pink bow? LIlly Pulitzer? Princess dress up?...Payback is Hell. I have sudden flashbacks of Duran Duran posters plastered in Sandi Wright's bedroom with a ice numbed earlobe and Sandi stabbing me with an icepick for that second piercing. Walaa. My parents were so chill about it. DId I mention I am the 4th child? Deep yoga breath. Move on Mama. Bigger issues on the horizon. Sozo has some summer surprises for you. Southern ladies Liz Barber (from Atlanta) and Taylor Thomas (Charlotte) are bringing some huge colorful abstract sercys to Sozo. Glass! Sozo is thrilled to debut local glass artist Carmella Jarvi. She's teasing you with elegant layers and layers of color creating fine art glass. Come spice up your summer with us. Take a morning or afternoon tour of our great galleries, museums, parks and restaurants uptown. Walk away from your neighborhood pool for a day and get some culture people! Miss Martha will be the only one at Sozo with an ice pick in hand. She'll be ready to serve you a refreshing cocktail. Everyone needs a friend that makes you laugh so hard you spew wine out your nose or have to cross your legs and pray your not going to pee in your pants. That's Melissa for me. Tennis brought us together and I can't imagine my life without her. We're down a set 4-3 on the tennis courts and losing to a woman easily 100 pounds overweight and has a knee brace and a limp. Melissa smirks to me 'They are laughing at you!' She knows how to make you laugh and how to 'light your fire'. Imagine a white Madea. That's Melissa. She doesn't even need to be drinking to come up with this stuff. Melissa had an irregular heartbeat for 13 years and recently had to have a cardiac pacemaker placed. She had 2 uncles pass away at a young age from heart conditions. Cardiac specialist recommended the pacemaker for preventive measures and because of Melissa's recent EKG changes. Melissa is educated. Melissa has 'connections'. Melissa knows how to advocate for herself. Melissa has a supportive sister and husband that won't take 'no' for an answer. Melissa is fortunate. She has this effervescent energy and love that I want to keep around forever. This month Sozo is giving back a percentage of sales to a local non-profit Heartbright.org. Heartbright provides education for the community in healthy lifestyles and funds preventive cardiology programs in economically disadvantaged communities. We want to support this local foundation for those unlike Melissa, who don't have support/transportation/education and resources. Join us on Thursday, May 29th 530-8. Bonterra is providing food and wine. I'm thinking I should sell tickets just to let you have conversation with Melissa. For as long as I remember him speaking, our youngest son Brown tells me every single night, "Cwack the door and leave the bathroom light on please." Two nights ago he had a sleep over and after I tucked the boys in he shouted out in his super K-o-o-L 9 year old voice, 'Mooom, crack the door please'…um um…but no leave the light on? Yesterday one of my favorite yoga instructors, Jenn Decurtins led me and about 60 other yogis in an awesome class. Our focus was centered around a great read she had just discovered and that it's okay to be vulnerable and to accept our imperfections. Our intention during those 75 minutes was to forget those imperfections and focus on the light within our hearts and the light that surrounds us. Yes, yes...you know me. I'm going somewhere with this. Chill. Yep, Runnymede and Sharon Roads. Our light. In 3 weeks Sozo will introduce a new featured artist, Laura Liberatore Szweda. Her works are all focused on LIGHT. Her inspiration of light has evolved since she's moved to the low country. Laura's works are layers and layers of rich color and texture. Sultry. Elegant. Radiant light. She'll pull you in with different color combinations that soothe your soul. The paintings draw you directly to the light each and every time. Light represents truth, peace, serenity, calmness, warmth, peace and purity. The lights are always on at Sozo. We'll even leave the door cracked open for you. Juan Francisco Adaro…Juan Francisco Adaro…Juan Francisco Adaro…..
Drop your southern accent, throw in a little latino flavor, say his name over and over and BAM!….you will instantly fall in love with him. Besides the fact that he's (sort of) tall, dark, crest white teeth and ultra handsome….he's one heck of an artist. Born and raised in Argentina. He's Sozo's vintage artist with a unique flair of modernism. His works are charismatic with life and big energy. The three dimentional touches are the extra bonus that bring his babies to life. It's like the toy in the box of cracker jacks or the prize in the bottom of the cereal box. (what happened with that?) Wooden wine boxes. Juan Francisco's wife Brooke is a sommelier and has a plethora of them. By carving the boxes with just the right curves and touches, Juan Francisco magically adds these to his canvases and TADA! the works come to life! To top that- he's adopted a mantra that he sings while he paints. Even better, (settle down ladies) it's an Argentina tango love song. Poorly translated into english it's basically…. Most of his works have these soulful words around the edges written in his fluid spanish handwriting. You can truly feel his paintings and each one tells a different story. Wooden boxes bringing canvases to life. Ying and Yang. Peanut butter and jelly. 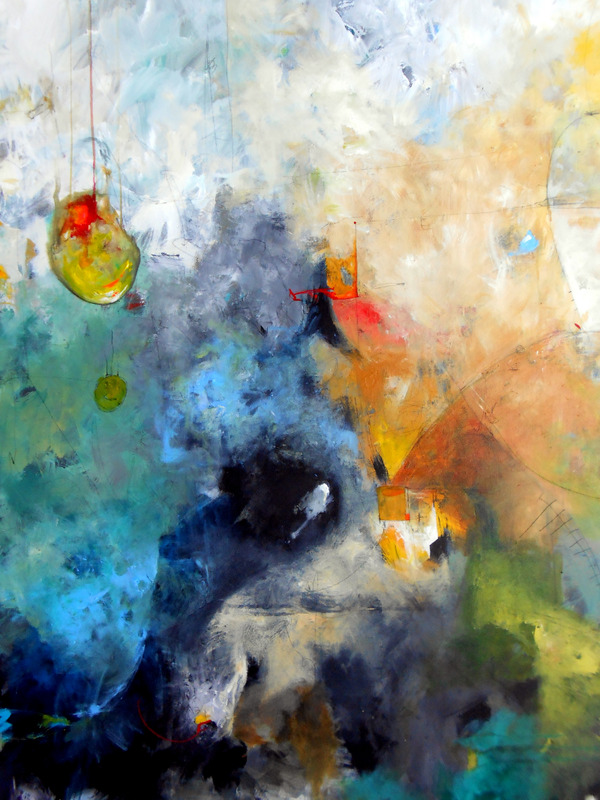 We are thrilled to open Sozo with the work of one of our favorite artists, Robert Langford. Langford works from a studio in Charlotte's Southpark area and is works hang in many public and private collections. He has exhibited his contemporary works at Red Dot Art Fair in New York (during Armory Art Week) and in Miami (during Art Basel) , as well as in numerous solo and group shows throughout the country.